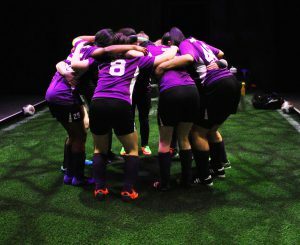 The stage has never been a comfortable home for sports stories — mainly because you can’t really show the fights, games or marathons — but Sarah DeLappe’s “The Wolves” is a remarkable effort to capture the politics, angst and hormone-driven conflicts on a girls’ soccer team. This play earned praise in New York and Chicago, and now it comes to the Unicorn Theatre in a production directed by Heidi Van. This is officially a coproduction between the Unicorn and UMKC Theatre and the cast is a mix of seasoned professionals and MFA theater students. And while some performances may not be all they need to be, nobody can question the commitment and talent of this young ensemble. DeLappe’s script achieves something rare by capturing the cadences and incomplete thoughts of actual speech while structuring the piece so carefully that backstories, conflicts and off-stage events become increasingly vivid within the cacophony of seemingly casual conversations. Often DeLappe employs overlapping dialogue that can be hard to follow but the end result is a play in which the drama is delivered by what isn’t said as much as the lines themselves. In a series of scenes contained within a tight 90-minute running time, DeLappe captures the transitory passions of teenagers on the brink of becoming women. Much of the world doesn’t make sense to them and DeLappe scores satirical points with amusing teen talk that reveals a wildly imprecise impression of reality. She also makes use of vivid off-stage characters, principally a coach with a drinking problem. The characters, for the most part identified only by their team numbers, include No. 11 (Emilie Leia Karas), the cerebral member of the team; No. 25 (Chioma Anyanwu), the team captain trying to instill discipline; No. 13 (Molliann McCulley), a stoner who defines herself with a wacky sense of humor; No. 46 (Lauren Moore), a newcomer with world travels under her belt; No. 2 (Hannah Iris Woolsey), a kind-hearted skinny kid whose mother insists that she wear protective head gear; No. 7 (Hannah Elizabeth Freeman), who cloaks herself in perpetual sarcasm; No. 14 (Chelsea Kinser), No. 7’s insecure sidekick; No. 8 (Un Joo Christopher), who isn’t as dumb as she pretends to be; and No. 00 (Yetunde Felix-Ukwu), the goalie with serious performance anxiety. In the final minutes, veteran actress Carla Noack appears in a moving scene as a grieving Soccer Mom. The action is set entirely in a warmup area of an indoor soccer field before and after games. The playwright requires intense physical performances as the girls stretch, exercise and practice their foot movements. The relatively narrow confines of the Jerome Stage at the Unicorn allow a playing area designed by Christian Taylor could afford to be bigger; at times the action feels a little claustrophobic. By the same token, DeLappe’s dramatic brevity is impressive for its finely calibrated specificity, but some viewers may find the drama to be a little to spare. Even so, the cumulative impact of this show is remarkable. It captures a palpable sense of reality. And viewers, regardless of how old they may be, will inevitably recall their own late teens and marvel at how little they knew while believing they knew so much. Late adolescence is a rough ride for most of us. And so it is for the Wolves. “The Wolves” runs through Dec. 30 at the Unicorn Theatre. Call 816-531-7529 or go to www.unicornthreatre.org.